Odda of Deerhurst was an Anglo-Saxon nobleman active in the period from 1013 onwards. 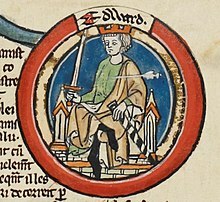 He became a leading magnate in 1051, following the exile of Godwin, Earl of Wessex and his sons and the confiscation of their property and earldoms, when King Edward the Confessor appointed Odda as earl over a portion of the vacated territory. Earl Godwin was later restored to royal favour, and his lands returned, while Odda received a new earldom in the west midlands in compensation. Odda became a monk late in life. He was buried at Pershore Abbey. Wulfric, called Wulfric Spot or Spott, was an Anglo-Saxon nobleman. His will is an important document from the reign of King Æthelred the Unready. Wulfric was a patron of the Burton Abbey, around which the modern town of Burton on Trent later grew up, and may have refounded the Benedictine monastery there. The English Benedictine Reform or Monastic Reform of the English church in the late tenth century was a religious and intellectual movement in the later Anglo-Saxon period. In the mid-tenth century almost all monasteries were staffed by secular clergy, who were often married. The reformers sought to replace them with celibate contemplative monks following the Rule of Saint Benedict. The movement was inspired by European monastic reforms, and the leading figures were Dunstan, Archbishop of Canterbury, Æthelwold, Bishop of Winchester, and Oswald, Archbishop of York.